Set over a tranquil lawn with frangipani flowers draping over riverside pavilions, Athithara Homestay is part of a growing trend to build new wooden stilted houses in the traditional Thai style in Ayutthaya. Average rating 7.8 from 138 reviews. Rooms in the elegant main house or cheaper editions in a second building are great options for travellers seeking peace and quiet. 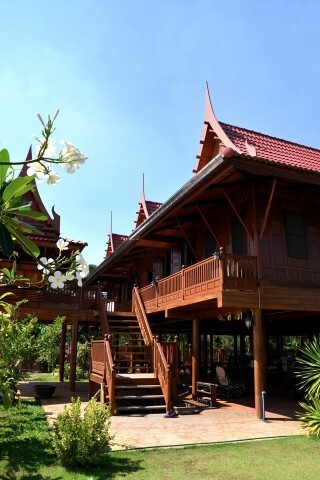 The main house features fretted dark-wood walls, glossy wood floors and Thai-style eaves topping a trio of triangular roofs. The three guestrooms are located on either side of a huge common room with a walkway extending to a river-view pavilion. Tasteful Thai art, wooden model boats and antique ceramics combine with Thai silk for a traditional ambiance. Spacious rooms in the main house come with semi-firm mattresses on the floor, several windows, TVs, desks, free WiFi and fridge. Two shared bathrooms and the central living area mean that you’ll probably bump into other guests at least a few times. If you don’t like to share, smaller and far-less intriguing rooms with private bathrooms are found in a second longhouse-style building that looks positively dinky next to the graceful house. A gravel car park makes this a good choice for those with a vehicle. A father and daughter who speak very good English provide bicycles and breakfast for free while also offering concise info on exploring Ayutthaya. The location is within reasonable pedalling distance of the Historical Park, far away from backpacker land and near a strip of boat noodle eateries. We passed a few barky dogs on the soi that leads to Athithara, where a few locals quickly got them under control. Check rates at Athithara Homestay on Booking.com.